This is very unfortunate. What we have here is a movie with an intelligent screenplay, wonderful performances and skillful direction, but it is a tactical miscalculation from beginning to end. The name of the movie is "One Magic Christmas," it comes from the folks at Walt Disney Pictures, and although it eventually arrives at a sort of happy ending, first it spends almost 90 minutes telling a sad, sad story. Since the movie was presumably made for family audiences, why did it have to be about all of the most tragic things that can happen to a family? Let me make a depressing list of what happens (and if you plan to see the movie, maybe you had better read no further - unless you are trying to decide whether young kids will like this movie). The movie is about the Grainger family, Mom and Dad and two kids, who live in a nice house on a nice street in a nice city. Then Dad loses his job. Since they live in a company house, they have to be out by Jan. 1. That means Christmas season is spent packing and planning to move. Just to make sure we don't miss the point, a Scrooge from the company comes around to show the house to the next people who will be moving in. This is a pretty desperate story for a Christmas movie to be telling. But, to be sure, there is another level to the story. 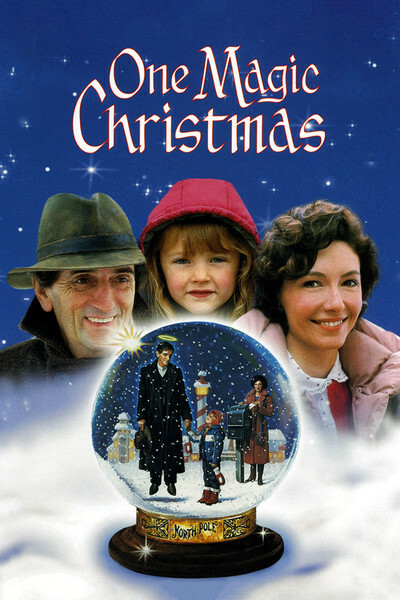 The Graingers' neighborhood is being watched over by the Archangel Gideon (Harry Dean Stanton), who is sad because Mrs. Grainger (the wonderful Mary Steenburgen) does not share the spirit of Christmas. Her lack of faith is sort of what has caused all the family's problems, I guess. And at the end of the movie, after the kids have been resurrected through one of the angel's miracles, Abbie gets to go to the North Pole and meet Santa Claus in person, after which her dad is brought back to life, too. This is a happy ending, but, boy, do we have to sweat for it. I don't know what the filmmakers were thinking of. Couldn't they have had the Graingers face some more everyday problems, like a sick dog or overdue heating bills? Did there have to be three deaths in the family, in addition to unemployment and no toys under the tree? Aren't they lay ing it on a little thick? I think so, and I'll bet little kids will think so, too. A lot of love and effort obviously went into this movie. The direction is by Philip Borsos, who made a memorable Western called "The Grey Fox." His images develop a real bittersweet resonance. Steenburgen finds just the right notes as the mom who doesn't believe in Christmas. She isn't mean, just cynical and tired. Arthur Hill is fine as a kindly old great-grandpa, and Gary Basaraba has a nice, winsome quality as he talks about wanting to open a bicycle-repair shop. I am not sure exactly what I think about Harry Dean Stanton's archangel. He is sad-faced and tender, all right, but he looks just like the kind of guy that our parents told us never to talk to. Anyway, all of these people work hard and carefully, and produce an intelligent and sensitive movie. For adults and older family members, it probably will work pretty well. But in the real world of commercial moviemaking, a Disney movie named "One Magic Christmas" is going to attract a lot of little kids, and I don't think too many sugarplums are going to be dancing in their dreams after they get home from this one.